Malaysia's ringgit hit a fresh 17-year low against the USD on Friday, panic buying seen on break above 4.05. The ringgit spiked to day's highs of 4.1213 per dollar, and has eased since to trade at 4.070 last. Fall in oil prices increased concerns over the country's exports, crude futures hit 6-1/2 lows weigh on MYR. 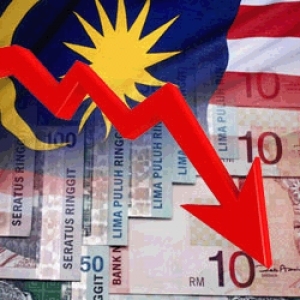 Country's internal politics had raised sentiments of uncertainty towards the administration, which, in turn, affected the ringgit. China's devaluation of the yuan, which is causing other Asean currencies to slump is further adding to pressure. Technicals indicate correction in the near term, RSI and Stochs at overbought levels and Stochs show bearish crossover.